This is the transcript of the second part of the conversation between Dr. Keki Mistry, an eminent consultant orthodontist and a long standing devotee from Mumbai, and Prof. G Venkataraman aired on Radio Sai a few weeks ago. In the March issue we had the first part of this conversation. To read that again, click here. We all went in and Swami counted us, “1, 2, 3… Where is the fourth?” and raised His closed fist as if holding something. We thought he was referring to the doctor. We said he has gone for his evening walk. Swami chatted with us, started talking about life and how life is not permanent and suddenly, a volunteer came upstairs and told him something in Telugu. Somebody came upstairs, Swami said, “Go downstairs”. We took him to the hospital, all four of the doctors. And then all four of us carried him to the burial ground also. He had gone. 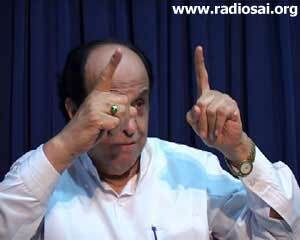 Only later I realized the import of the indication that Swami made earlier with His gesture as if holding something. He was referring to the fact that there are four persons needed to carry the corpse. Dr. Bhaskar Rao realized and believed the indication. I didn’t catch it at that time. I have another story. Do you know the famous story of Patel? 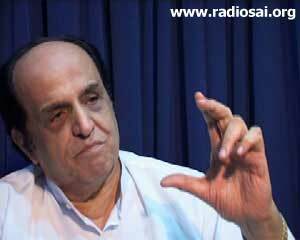 Patel is a Parsi gentleman, used to work for Noble Paints factory. Patel married late in life and after about 3-4 years he wanted a baby. He got a baby girl. God gives children - he should not give children like this. This girl was born with a muscular problem, a spinal problem. If I took a kerchief and dropped, the kerchief would collapse, the same way the girl if left out, will collapse at the age of 3, she was nothing. She couldn’t move her eyes, she made some gurgling sounds. And that was it! So he went to his wife and she said, “This is all black magic, I don’t believe in this kind of things, I am not going to go.” But he was desperate, so he took a photograph of the child and went to Puttaparthi. He didn’t know where it was, they took directions. He arrived in the afternoon in the days of the old mandiram (old Prasanthi temple). And Swami used to give darshan on the first floor. He saw Swami standing there and He made a wish: “If you really are a man of God, then you will help me with my child.” He says, his eyes never met Swami’s eyes. Swami went inside. Then He asked people what to do. They asked him to sit for darshan. “Swami comes out, He calls people for interviews. You may get your chance,” they said. He sat and waited for the evening interview. That day, Swami comes out, walks towards him, but not looking at him at all. He picks a person to the front of him, he picks a person to the right of him, left of him, takes a person behind him, but leaves him and walks off. He was bewildered. After Swami went inside the interview room, he started talking. He asked other people and somebody said he has been here for one week, another said they have been here for 3 months. He became very nervous. He had taken only 10 days leave. Anyway, somebody said, “Morning there is another interview. Swami will come tomorrow”. So he went back. Next day same thing happened. 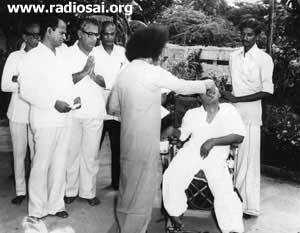 He tried every means to try to catch Swami’s eyes, but Swami never looked at him. In the evening too, it was the same thing. Something happened to him. This went on for 10 days. Something in him made him stay. He sent a telegram to his office, asking to extend his leave. “On the 14th day,” he said, “an old gentleman comes out of the ashram and says Swami is now leaving Puttaparthi. All may go, all are blessed.” He obviously got very upset. He had already fought with his wife to come here. So he went on the railway track and put himself down. “Some train will come, I will commit suicide.” But in India sometimes trains run late, so he was lying there for quite some time. The train didn’t come for a long time. Then as he was lying there, he started thinking, “Is it fair to leave my wife alone with the child? Am I taking the right step?” So many thoughts filled his mind. Finally he got up and reached home, 18 days after he had left his house. It was an evening and as he opened his door, there was this girl whom he had left as a vegetable, sitting up, playing and when she saw the father whom he had not seen for 18 days, he said, “She got up, toddled towards him and said ‘papa’. I put my bags down and cried. I just cried.” I am not saying this child became completely normal. But this child could take care of itself; this child could put the shoe laces on, put the shoes on. She is still alive and parents are not really willing for her name to be spoken, but I have seen the child. I am not saying she is fully alright, but what a blessing from being completely unable to take care of herself to attending to herself. She was now able to do her own things, going to the toilet, etc. She was not there with Swami. Swami had not even met this man. Swami had not even spoken to this man. This man didn’t go to Baba with any faith except desperation and he did not have any belief in Baba. Prof. Venkatraman: I want to change the wavelength for a brief period. Because you must come again and again to tell us your abundant stories. This point I just want to ask you one important question. 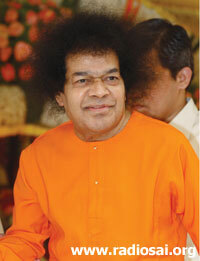 We all know about Swami that He is the Divine in Human Form. Of course He comes to rescue us - help us in our movements of difficulty in crisis as you have described, and He has also come to give a very profound message. You come from the city of Mumbai. There people are so busy. They don’t have time for anything including God. You have lived there all your life. Do you think Mumbai now has a population approaching that of Australia ? Will it wake up to Swami? If it doesn’t, it is going to be in trouble. 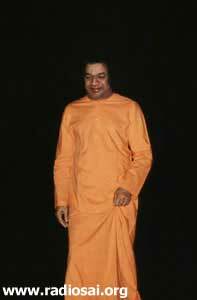 Remember 1999, when Swami came, all those people who spoke in Cooperage, “Swami help us, Swami Help us.” How can Swami help when people don’t help themselves? Dr. Mistry:That is very true. God has always said that He is there. His grace is there. Swami has put it very simple and more direct. If there is a laddoo (a sweet delicacy) in front of you and you chant “Ram Ram Ram,” Laddoo is not going to leave the plate and come into your mouth. You should take the hand, pick up the laddoo and eat it. This is very profound, the message that you must act. We have always heard that God helps those who help themselves. I think Bombay has woken up. I think there is a profound change, there is a hunger, as man evolves more, in the other dimensions of life, in physical things, in his financial things, he suddenly realizes there is an element of life that is missing in him. You know when a person like Bhagavan Baba comes forward I think people would awake. Because one of His messages is He has not come for these miracles. These are actually his calling cards, as he said. Believe me they were necessary for some individuals, like me, to go to Him, though I would consider that I was not spiritually raw, but I had no acceptance. I really believed in my arrogance in my ignorance, not disrespectfully that all these things were spiritual crutches. That has not made India progress. I have come to eat my words. Change yourself. 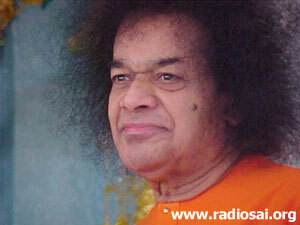 Swami has told us very clearly that: “You are not one person, but three. The one you think you are, the one you really are and the one others think you are.” And Swami has said pointing to us: “Change the one you really are.” Not for the sake of the world, not to make a pose, not for anything else or anyone else. Change the one you really are, Swami has pinpointed it to us. Swami has not missed a single opportunity to drive a lesson home. Once in Parthi, we were walking down and volunteers were making chapattis. He doesn’t miss a single chance. I didn’t think that what you meant was just that you will make yourself physically unapproachable. Now Swami, you have successfully limited the approach of people. You have confined yourself to a vehicle. Then He said, “Why are you full of yourself? Why are you so much attached to the body?” I said, “Swami please, for all our sake! We don’t need this kind of a lesson." 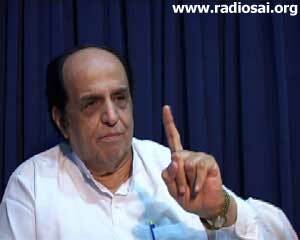 Prof. Venkatraman: So do you think the youth of Mumbai will be able to absorb Swami’s lessons and practice? Dr. Mistry:I think so, I am a teacher, and I am 70 years old. I have been in teaching for 45 years. I think the youth of the world today are a completely different breed. They think they are more intelligent, they are more aware, they are more up to the mark and they are quick to grasp things that we with our intelligence or fettered ideas were slow to accept. I think the youth of today is very willing and very open but they need to be channeled with the Grace of Bhagavan. Because I have come to one conclusion. You can knock your head against the wall; unless your time comes, you do not accept. There I ask Bhagavan’s Grace. That He will give them that blessing, that time that they will accept Him easier and they don’t need to knock. It is a fact. Previously the sages and saints had to perform so many practices before the avatar. Now Bhagavan is available to us. He gives us, even tells us, how to approach Him. We don’t listen. Many times when we were alone or together, or when a group of us used to be there, Swami used to sing, “Where is the real devotee? Where is My real devotee?” I have heard Him. Swami is actually crying for a real devotee. I have heard this with my own ears. Out of the blue He will suddenly say, “Where is My real devotee?” I think that the grace is there. The youth is prepared. The youth are intelligent, clever, they are eager to grasp. I think our generation may not be that easy as the youth. I think this is true for every generation. I remember the words of the famous Sufi poet Omar Khayyam. He says in his Rubaiyat (it has been totally wrongly interpreted in the west) which contains a wealth of spiritual meaning. “There was a door, to which I found no key. There was a veil past which I could not see. Some little talk a while between me and Thee. And then no more of me and Thee. Then to the rolling heavens itself I cry. It is not an awareness, It is an Understanding Awareness! Understanding of the Self; an understanding of who you are, an understanding of what the circumstance is; just being aware; an understanding awareness. That what all of us need, that’s why I am saying, some amount of Grace is always there. I said, “Swami, you have put in a donkey in a place to show the world it can be done. Is it ok?” We laughed. Same thing when he made me chairman of the Bombay Committee. “Swami there are so many leading industrialists, so many big shots. How will they all listen to me?” I was a young man then, about 35 years ago. And I must tell you by His grace, everyone listened to me and I had a glorious time as a Chairman and even as a Trustee. So Swami is there for the youth. The time will come when the youth grasps it. I think the youth are more spiritually hungry than before. You hear of drugs. This is all I think an expression of hunger. The directions are different. At the moment certain things click, you know. I am sure even in society, I hear spirituality word used 300 times more. Now different people have different concepts. Prof. Venkatraman: I am very glad because you are very optimistic about the youth. It is 33 years since I have left Mumbai, and I have had only occasional contacts, we hear a lot about crime, Bollywood and so many things. But behind all this, it looks like there is a lot of hope and I will take your word because you have lived in that confusion and chaos. Doctor Saheb, I must really thank you and say you created a great appetite in all of us and I am sure all our listeners. So you have a duty to keep coming again and again and tell us more and more from your bounty. Dr. Mistry: It is a blessing that you have asked me to come. It is sheer pleasure to talk about Bhagavan Baba. 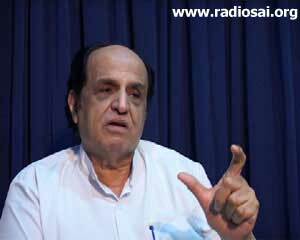 Prof. Venkatraman: It is a greater pleasure to listen about Bhagavan Baba. Thank you so much! Sai Ram! Dear Reader, did this article inspire you in any way? Would you like more of such conversations with Sai devotees? Please contact us at [email protected] mentioning your name and country. Thank you for your time.